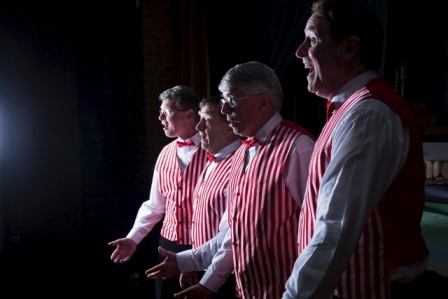 The barbershop style of harmony singing is produced by four voices singing a cappella. It is important that prospective members feel comfortable in this style of singing. Hold your part against other parts. To this extent a qualifying period of 5 weeks has been set aside to allow prospective members the opportunity to hear and participate in the barbershop style of singing with a personal audition in a quartet in the presence of the Music Director (MD) at the end of that period. A handbook is available which contains the procedures which will be followed over the 5-week period before audition as well as a list of the responsibilities and financial commitment of membership. If you don’t fully qualify on the first attempt, don’t worry. The MD will discuss with you what you need to work on and set some further training so that you can have another go. Do not hesitate to ask your mentor any questions to help you learn and enjoy Barbershop Harmony singing. Remember this is a hobby for all of us. RELAX and ENJOY! Barbershop singing is a relatively inexpensive financial commitment compared with many other hobbies and sports. Overall ongoing membership costs amount to only about $4.00 per week (payable in quarterly instalments of $50.00). This helps to defray many ongoing Chorus expenses which includes sheet music, training tracks, copyright fees, rehearsal hall hire, external coaching, costumes, public liability insurance as well as registration with National and State bodies (Penrith Harmony is a member of Barbershop Harmony Australia which also has its own Eastern Region of which we are also members). In addition, members are expected to contribute $1.00 per week to cover supper costs. Will assess your singing ability as a prelude to starting your 5 week qualification program.